To celebrate the festive season, I would like to present you with the December roundup of No Croutons Required - Festive Photos. 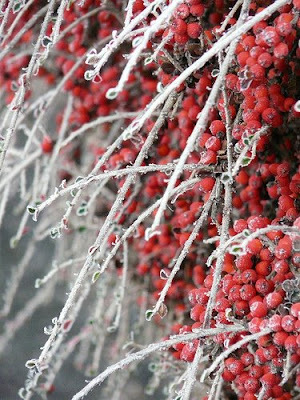 Our first entry is from Wendy over at A Wee Bit of Cooking who has submitted a gorgeous picture of some frost laden berries. Wendy is surrounded by some beautiful countryside, which she explores with her beloved and extremely cute dog, Marco. Next up is Antonia from Food Glorious Food. 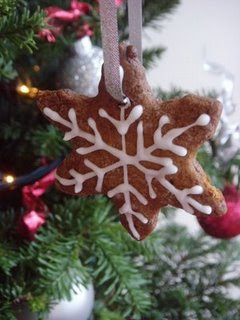 Antonia has taken a shot of her Spicy Christmas Tree Biscuits she baked and decorated to festoon her silver and red themed Christmas tree. 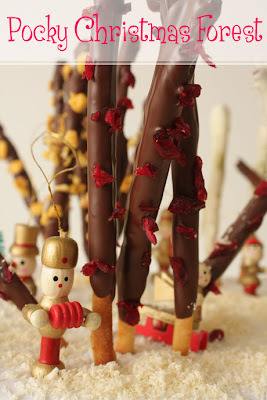 If you would like to make these Nigella inspired Christmas decorations, then head over to Antonia’s blog for the recipe. We are visiting Lysy over at Munchkin Mail next. Picture the scene. 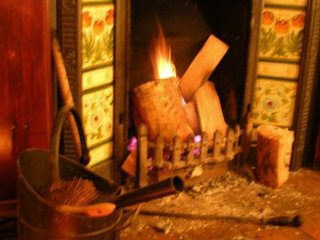 It’s a cold winter’s night and you are cozied up in front of a log burning fire, chatting with a friend and sipping mulled wine. Perfect! 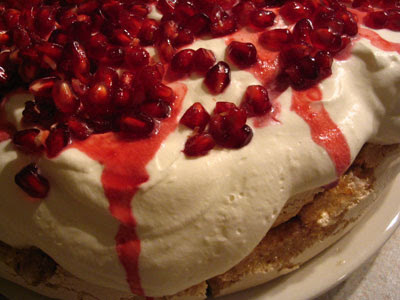 One of my dearest friends and my co host, Lisa from Lisa’s Kitchen has whipped us up a decadent delight of a dessert. I have to leave the description of this masterpiece to Lisa, who could rival Nigella herself while extolling the virtues of this dish. Feel free to drool! “Like an enormous roasted marshmallow with a thick crispy caramelized-sugar exterior surrounding a light and creamy meringue” with “a jaunty slathering of whipped cream and a reckless scattering of fruit on top”! We are flying to Sydney next, to visit Lorraine over at Not Quite Nigella. (much as I love Nigella, I am honour bound to point out that is girl is way better than Nigella when it comes to baking and should consider renaming her blog!) Anyway, back to business! Lorraine has introduced me, for the first time to Pocky. These delicious bites were something that Lorraine treated herself to while visiting Tokyo and they have stuck in her mind, as you can well imagine. After accidentally abandoning her batch at her sister’s, Lorraine decided to make her own and the results are quite wondrous! 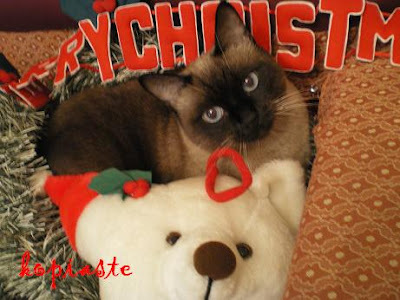 Ivy from Kopiaste has sent us a photo of her cat Lisa, who has definitely got into the Christmas spirit! Ivy also made some rather gorgeous Chocolate and Pistachio Brownies which she served with a raspberry sauce. You may want to pop over there to see the recipe. Johanna over at Green Gourmet Giraffe raises a glass of Festive Punch to us while she looks back on the year and thanks everyone who voted for her in previous challenges. Will this be third time lucky for Johanna, I wonder? The punch certainly looks delicious, as do the mince pies, she served with it. Johanna’s festive drink is a Spiced Redcurrant and Orange Punch with a splash of Cointreau. The Cointreau is purely optional and can be left out when served to those kindly souls who will be doing all the driving this Christmas. I now like to introduce you to a new contributor to No Croutons Required, S from Vegan About Town. S made us a Potato Salad, but not before she had made me green with envy by describing her 37 degree weather and a trip to the beach! 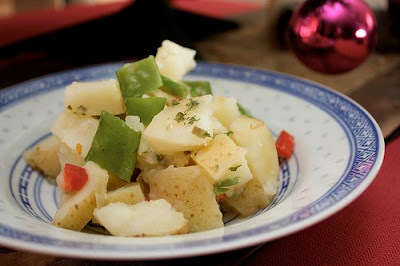 So there will be no wintry scene from S. She did however taken the shot of her Potato Salad beside her Christmas Tree. Next up we visit Soma from eCurry. 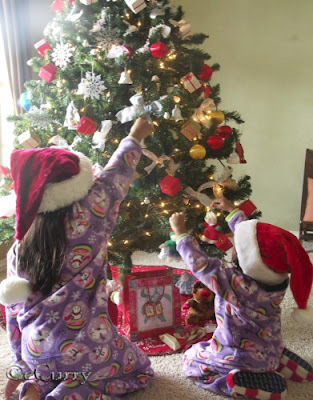 Soma has taken a photo of her children decorating the Christmas Tree. Now isn’t that just a perfect photo? Soma also baked some Christopsomo (Christ’s Bread). Christopsomo is the traditional Greek Anise flavored Christmas Bread. You can find this recipe on the same post as the photo of her 2 little elves. DK from DK’s Culinary Bazaar has made us some Christmas Shortbread. If you have never made shortbread before, then head over to DK’s post, to see a nice simple, step by step photo guide. DK used a basic recipe for shortbread, but added ground almonds for extra flavour. 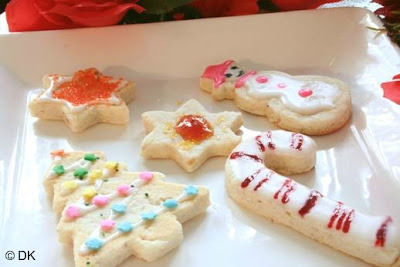 She was ably assisted in decorating her shortbread by her two little guests, but advises that you would be wise to make extra icing when children are helping you bake, as it seems to "dissolve in thin air". We are visiting Anne from Anne’s Kitchen next and a photograph of her favourite tree decoration, a cute little stripey cat. 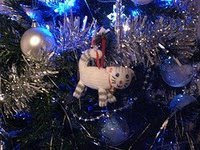 Anne bought her mum the same little cat, so it makes her smile every time she adds it to the tree. Oh, how I covet it! We are travelling to France next to visit Priya of Priya’s Easy N Tasty Recipes. 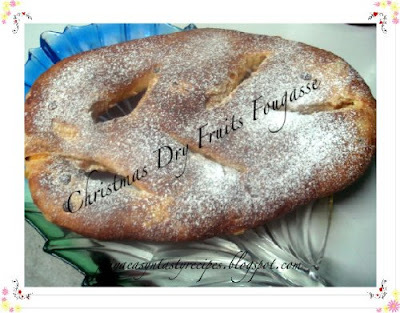 Priya has made us a flat bread, which she has named Christmas Dry Fruits Fougasse. Fougasse is a flat bread typically associated with South Eastern part of France. There are sweet and savoury versions of this flatbread. The savoury version sometimes includes Roquefort and nuts or olives and goat cheese, which I hope Priya posts about another time, as they sound really good. This time, however, Priya has made this into a sweet Christmas bread with dry fruits soaked in Orange Flower Water. Can you imagine the smell off this as it bakes? Lovely! Next up is my entry for the challenge. 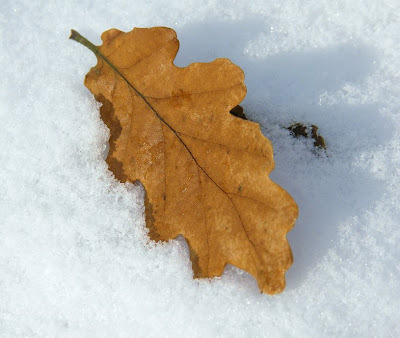 It is a photo I took on a recent walk through the snow with my friend Andrew. We had a great time, all wrapped up against the cold, crunching through the snow and watching children sledging and dogs gallopping about, then heading back home for some soup to warm us up. Snow always reminds me of Christmas, even though the two coincide so infrequently. Our last and final entry comes from Ricki over at Diet, Dessert and Dogs. Ricki has made Marzipan-Topped Shortbread Cookies. The marzipan in question is Ritter Sport Marzipan chocolate, which is cut into triangles and pressed into the top of each cookie. Ricki is suggesting these handsome cookies as a gastronomic gift for Christmas. Oh what lucky friends Ricki has! In a totally unrelated aside, while I was reading about Ricki’s entry, two young boys walked past my house and I could here them singing “Oh ye canny chuck your granny of the bus!”, it did make me laugh and now Ricki’s cookies will be indelibly linked with that song in my head! So, if you have a favourite photo out of this roundup, then please vote for it in the voting panel or send me an email. The voting poll will be up until the 30th, then the winner will be announced at Hogmanay. Love the roundup, Holler! So many creative entries and gorgeous outdoor shots. And now I am going to forevermore hear that song in my head when I think of cookies--oh, no! This was such a great idea! I really enjoyed looking at the submissions (and am sorry I didn't get one in). Next year? Happy holidays to you and Graham. It is one of those songs that stick Ricki, unfortunately! It was good hearing the two wee lads singing it with such gusto though. Those photos have me feeling very festive indeed! Fantastic roundup Holler! Such a good idea for the holiday season. Sending you a great big hug. Oh, how lovely! I couldn't participate, but I think it's ok, I wouldn't be able to compete with such nice photos! 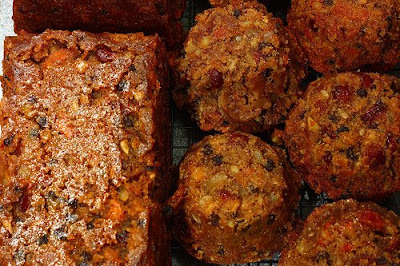 Very nice pics ... its always nice to see the season from such different perspectives..
M'dear, just so you know, we left the fruitcake muffins in the freezer just for you guys... so, no pouting. 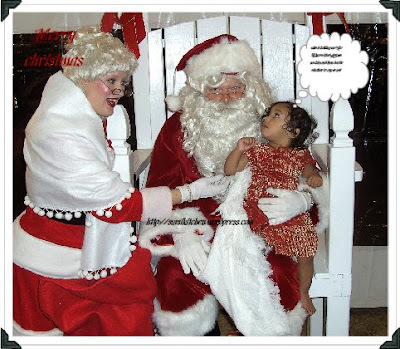 Santa's watching. I am sure you will catch up with us another time Rita. They are a nice mix of photos this time, which is great! Thanks Johanna and a Merry Christmas to you too! Sorry about that S! I'll tell you what, I will add your photo to the end of the post, so everyone (well a lot of us) can be jealous of your good weather! Hi Wendy, I can just imagine you all in the car, singing at the top of your lungs. Very funny! In our house it was always "cos she's your mammie's mammie ".....probably because she made the best potato soup ! Happy New Year Holler. 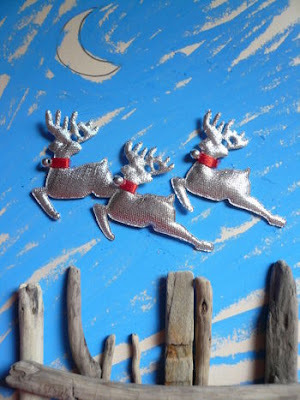 That was a great idea to make this festive roundup. We enjoyed it very much.